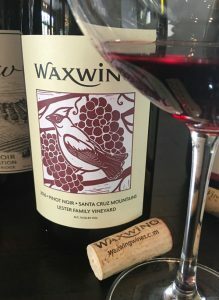 2016 Waxwing Wine Cellars, Pinot Noir, Lester Family Vineyards, Santa Cruz Mountains. Scott Sisemore’s Waxwing Wine Cellars is a micro winery in Belmont, just south of San Francisco that produces small batch hand crafted wines from unique vineyards from the Santa Cruz Mountains to Mendocino County with a focus on Sonoma Coast with mostly Pinot Noir and Syrah wines. I’ve been a fan of Scott’s wines for many years now, and especially his Lester Family Vineyard Pinot, which his was nice enough to let me get a preview of, his wines are richly flavored and he uses mostly used French oak to allow a more pure focus to show through, they are forward in style and authentic in character with just a hint of rustic charm. The 2016 Lester Pinot is a surprisingly full and bold wine, it starts with a tight and firm feel, it takes some time to open up giving a very serious impression with a touch of Burgundy like reduction and grip before revealing it’s more vivacious personality and deep fruit core and lovely incense/floral tones. The nose starts with rose petal, graphite, loamy earth, cola and kirsch which leads nicely to it’s medium full palate of Pinot fruits with bing cherry, black plum and framboise layers along with interesting candied citrus, mineral elements, saline and a mix of vanilla/mocha, star anise, tea spices and cranberry. This single clone 115, two barrel Pinot Noir that is grown on the western Corralitos hillsides with a make up of sandy loam soils really turns on the style after about 25 minutes and getting plenty of air adding a dense and round textural mouth feel, it is wine that certainly prefers food to show it’s best, Sisemore helpfully added his own ideas, which include crispy skinned roast chicken, wild mushroom dishes and seared duck breast with cherry/berry reduction! Scott destemmed all the grapes and used Assmannshausen yeast to ferment along with a five day cold soak, all pretty mainstream techniques and used one year used French oak, it proved a ripe vintage coming in at a natural 14.5%, it rested in barrique 15 months, and should be released soon. This is one of the best of Scott’s Pinots and it should drink nicely for 5 to 7 years with ease, best from 2019 to 2026.